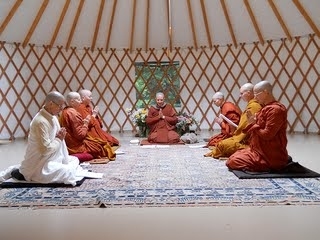 For all those who worked so hard to prepare this beautiful space, it was an aspiration come true when, quietly this past Monday morning, in our yurt Dhamma-sala surrounded by mist-shrouded redwoods, 7 women dedicated to monastic life entered into the traditional Buddhist vassa retreat period. Pictured are Ayya Tathaaloka Bhikkhuni (center), Ayya Sudhamma Bhikkhuni (right front), Adhimutta Samaneri (mid-rt), Phalanyani Samaneri (fore-rt), Ayya Sobhana Bhikkhuni (left front), Suvijjana Samaneri (mid-left) and Anagarika Marajina (fore-left) in the hermitage's Dhamma-sala yurt. Full photo album is here. This is the first year, in North American history, that our Theravada Buddhist women's monastic community has gathered together to observe the vassatime retreat together. It is a beginning; a beginning that is the culmination of many years of dedicated effort and slow nurturing of the causes and conditions for women's *Sangha* to come together. Our first week of retreat together has been one of intense yogi work, lovingly collectively laboring to prepare and arrange the public and monastic commons areas, tent and kuti sites and trails for our full 3-months retreat time together - the completion of the past 2 years and 2 months of efforts by so many dear Dhamma friends. This month of August will be spent here in our Awakening Forest in monastic community life training, and preparatory training for ordination for the 3 samaneris who will be being fully ordained as bhikkhunis at the end of the month. The remain two thirds of the vassa retreat is dedicated to deep, quiet meditation retreat time, in seclusion and together, in the heart of the practice here in this great forest land. Our thanks to all dear friends whose dedicated efforts, in kindness and generosity, have made and are making this retreat possible. We hope that this time will bring profound benefit to not only our own hearts and lives, but to our society as a whole, to our world, and all living beings.